So The Boss is back home from a whirlwind tour of the East Coast arranged by The Travel Arbitrageur — that would be his wife. Can you say Registry Collection? He has adopted The Boss’s old trick of meeting each new employee at the door in a crisp white shirt, suit and giving them the first 30 minutes of the new hire orientation personally — Vision, Mission, Strategy, Values booklet stolen from an exemplar provided by The Boss. You can find one here. Who do you really work for — anyone? So the question of the day is — who do your folks work for? The new receptionist — who does she really work for? Those new programmers — who do they really work for? The new CFO — who does she really work for? CEOs and founders are being told by the wise men of the Internet — the Digital Illuminati — that those folks work for the founder. Is that really true? CEOs have a tough enough job without having to be charismatic in addition. Make no mistake, many CEOs and founders are, in fact, quite charismatic. In the Old West, cowboys rode for the brand. Literally. No, they didn’t ride for that “brand” — the one the guys in marketing had made. That nonsense had not been invetnted yet. We’re talking about before barbed wire had been invented and cattle roamed and grazed freely moving from the wind, rain and snow. They literally rode for the hot metal brand that was used to mark ownership of their cattle. Branding the cattle was an ownership exercise like getting a patent. Well, close, maybe? The symbolism is that a Rocking T cowboy was loyal to the Rocking T and a Bar JR cowboy was loyal to the Bar JR.
Of course, the cowboys were being paid by their ranch and it was perfectly logical that they would be loyal to whomever was paying them. The ranch foreman and the ranch owner were the power figures in this firmament. Smart ranch owners paid their cowboys face to face thereby providing a clear understanding as to who was paying the bills but also as a means of allowing a cowboy to voice any complaints. This idea of riding for the brand came up continuously — before the advent of barbed wire — when herds were commingled on grazing land and when being driven to market. A bunch of cowboys from one ranch would want to “cut the herd” — winnow out the cows with their ranch’s brand to ensure that their cows did not get driven to market or that the calves from those cows did not get someone else’s brand on them. Cutting the herd was not a perfectly friendly process as there were always unbranded cattle — Mavericks in the parlance of the day — and they had to be accounted for. Many a cowboy put a cow and its calf a hundred feet apart and slapped the calf to see which momma cow it ran to for protection. This established ownership. In the military, it has long been established that soldiers fight for their fellow soldiers — their buddies. Organized into fire teams, squads, platoons, companies, battalions, brigades/regiments, divisions, corps, armies and army groups — most soldiers struggle to know anyone in the hierarchy above their platoon leader. 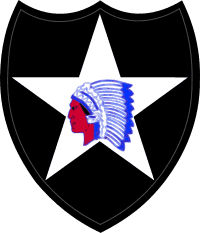 Maybe they know the name of their division commander — typically a Major General with two stars. A division is the largest unit with any personality but very rarely does anyone come into contact with their division commander. Interestingly enough, when The Boss served in the 2nd Division (Indianhead Division) in Korea, he used to go pheasant hunting and fishing with the division commander and served under the same General in the United States. They used to go fishing and The Boss — an engineer — was the navigator as they issued forth from Barnegat Bay in New Jersey on a little Boston Whaler. There is a great story here but suffice it to say that the Division Commander had his eye on the future potential of The Boss even as a Captain. The Boss — who was a professional soldier — opines that the ability to personally inspire soldiers to fight is lost above the platoon leader level. This accounts for why the military — Army and Marines particularly — places such emphasis on the quality of the lieutenants who lead such units. It is very difficult for a platoon to be very good if they have a lousy platoon leader or commander. The Boss knew a lot of damn good ones and a few lousy ones. Founders and CEOs are required to be charismatic leaders as well as visionaries. Isn’t that right? Well, no, it really isn’t but the Digital Illuminati have set such high standards for what a founder, CEO is supposed to be that we are drifting in that direction. It is a very high expectation and The Boss feels like it is an unrealistic and quite suspect expectation. Very few founders and CEOs rise to the level of being charismatic — a leader’s personal magnetism or charm which arouses inspiration and devotion amongst followers. Here’s the bottom line — your folks are not working for you, Mr Founder and CEO, even in the unlikely prospect that your are a charismatic CEO. They are likely working for themselves or their work unit or the company culture. Do not take the Big Red Car’s word for this — hey, you are talking to a 1966 Impala convertible, but that is another problem — try to find it out for yourself. Know also that this is a fleeting target you are trying to hit. In the life of your company — fledgling startup to gargantuan success — this will have changing answers and will not be universal amongst employees. It will change with where the company is at a given instant in time. Because when you know for whom your folks perceive they are working, you can then use your magical CEO powers to use that conduit or locus for retention. If you get a sense for why and for whom your folks are working, you can harness that knowledge to create long term retention. If they are working for the company culture — a very small difference to “riding for the brand” — then you can ensure that your personal communication, the company’s policies, the rituals, the rewards, the recognition — and all the things that make up the foundation for the company’s culture, not the Friday afternoon happy hours — are all aligned to serve the interests of retention. But, hey, what the Hell do I know anyway? I’m just a Big Red Car. Now get out there and create some jobs. You’re doing great. This entry was posted in Advice, CEO, company culture, Inspiration and tagged who do you work for, work, work for. Bookmark the permalink.